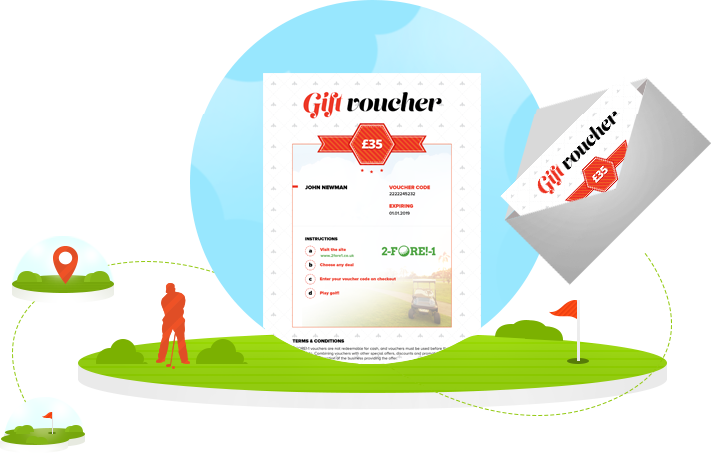 2-fore!-1 is the number 1 discount golf voucher scheme in the UK offering 2 for 1 golf vouchers. With more than 700 golf courses covering every region in the UK including Ireland and Scotland, you can play all year round and save £1000's. 2-fore!-1 has multipack's of golf vouchers from as little as £1.80 per voucher. There is no waiting - get your golf voucher instantly! We feature golf courses and golf clubs all over the Uk. We have hundred of public golf courses that accept our 2-Fore!-1 vouchers, saving 50%. Click here to browse or search for golf courses near you. 2-Fore!-1 is the the best place to find golf online. Search our directory for 100's of golf courses online. Get a 2 for 1 voucher then book your tee times, save 50%. The UK is one of the best counties in the world for golf. We features 700+ courses with amazing discounts. 2-fore!-1 has the perfect Gift Voucher for anyone. Get your voucher instantly - and redeem anytime for up to 1 year. Get a multipack gift voucher from just £11. You will receive a beautiful gift voucher that can be redeemed for any of the courses on this site. Looking for the perfect golf driving range near you - you can search for 100's of uk golf driving ranges all with savings of 50%. Looking for the perfect golf break while saving 50%. Search 2-fore!-1 courses to find a golf break near you with half price golf options at 700+ courses. Save on your golf lessons by booking with a 2-fore!-1 voucher, green fees at half price. 2-fore-1 was previously operated by Today's Golfer - but is now part of the The Golf Network. 2-fore-1 is featured in Today's Golfer Magazine and website. 2-fore!-1 offers 100's of discount green fee vouchers - saving 50%. We offer the best selection of discount green fees in the UK. Looking for a golf course near you? Search our directory to find 100's of golf courses in the UK with 2 for 1 (save 50%) discounts. There are 100s of country clubs available with 2 for 1 discounts. Browse our directory. Looking for the perfect golf fairways in the UK. We showcase 100's of beautiful fairways - all saving 50% with 2for1, half price golf offers. Find your Tee Off Times at 2-fore-1 and save 50% on 100's of golf courses.